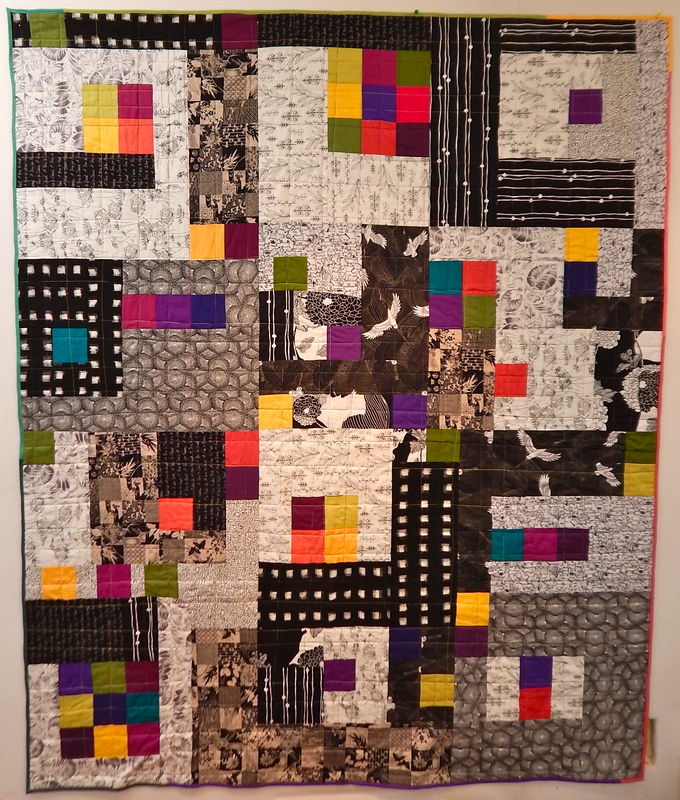 Last weekend I went to the Pacific International Quilt Festival (fantastic!) and in less than a week I will be in Houston for the big show! Its my first time to go to Houston, and I am going with my BFF, so am totally excited about the experience. 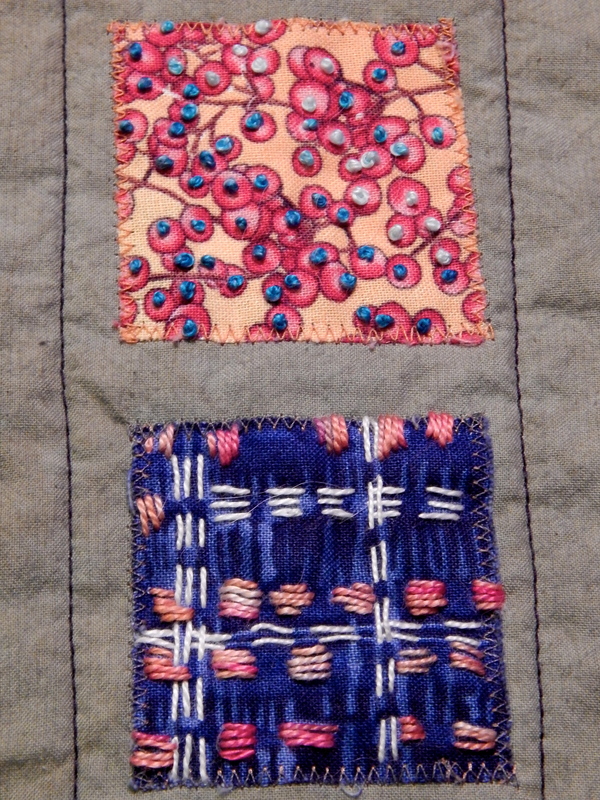 In between I have been stitching away on the ‘many crosses’ quilt. 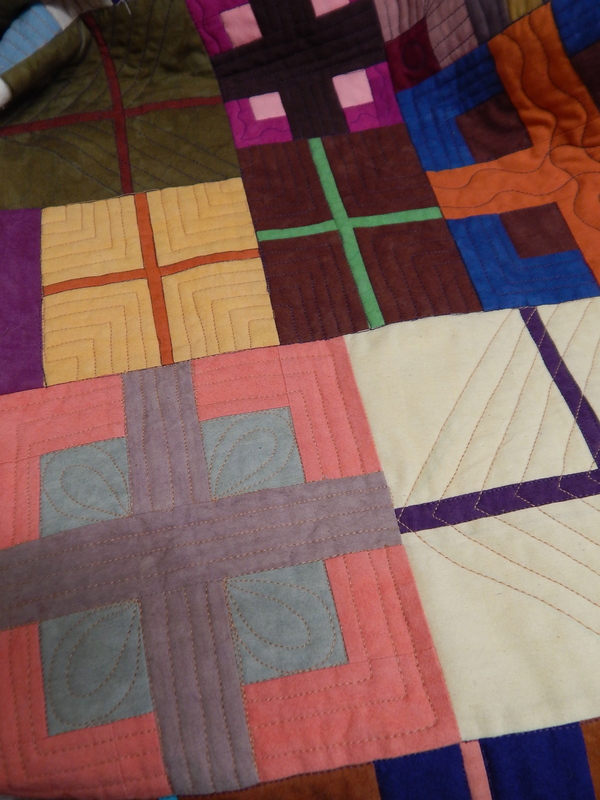 I started out with some diagonal stitching on some of the crosses, and then didn’t know where to go with it. BFF suggested spirals, and I love those, so when I came home from PIQF, I found a leftover block from that quilt and did a few spirals on it, then tacked it up next to the real quilt on the design wall. 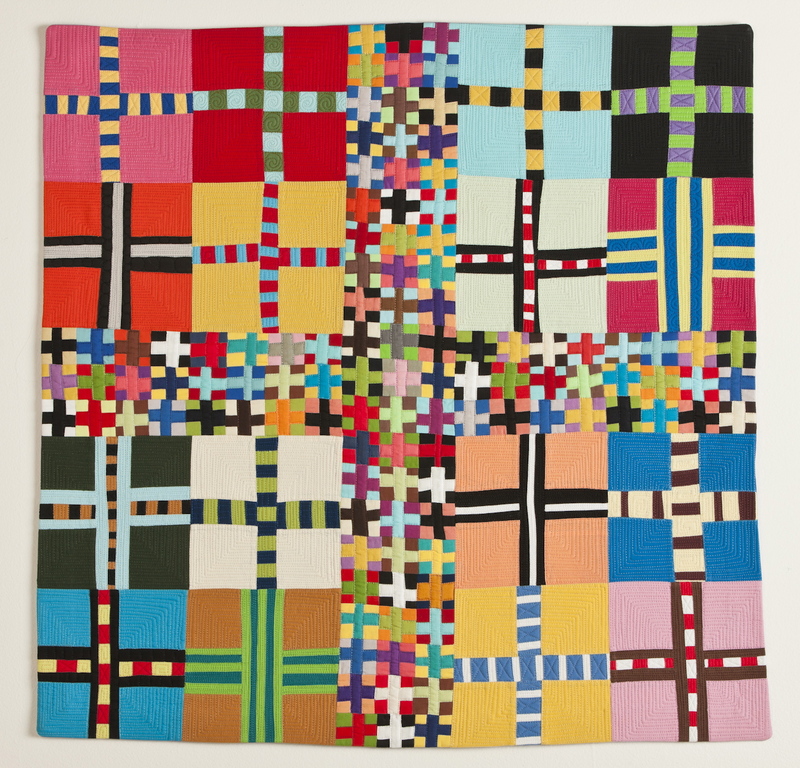 I could see right away that that was too distracting, and the thought came into my head “you need to quilt each of these crosses individually.” And just as quick as that, I was off and quilting. It made me so happy to have a plan. Here’s a few shots of what I’ve been doing. In the late afternoon, and into the evening, I watch TV shows and stitch away on the little squares quilt that I put together just for the purpose of having something to hand stitch. 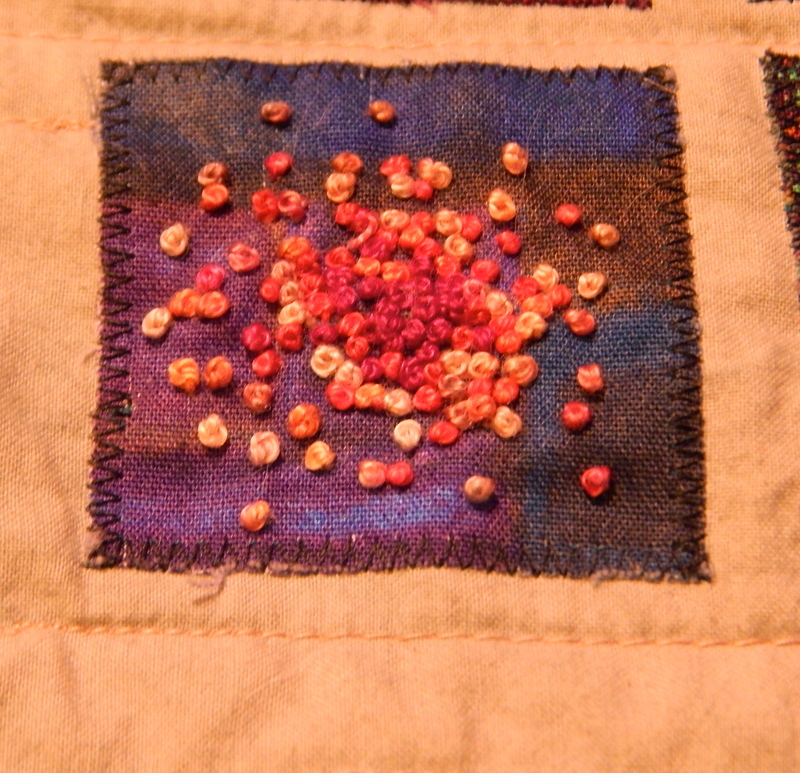 At first, it was disconcerting to try to do any stitching on these little two inch squares. But the more I’ve done, the more I’ve gotten into it. Each one is a little composition on its own. 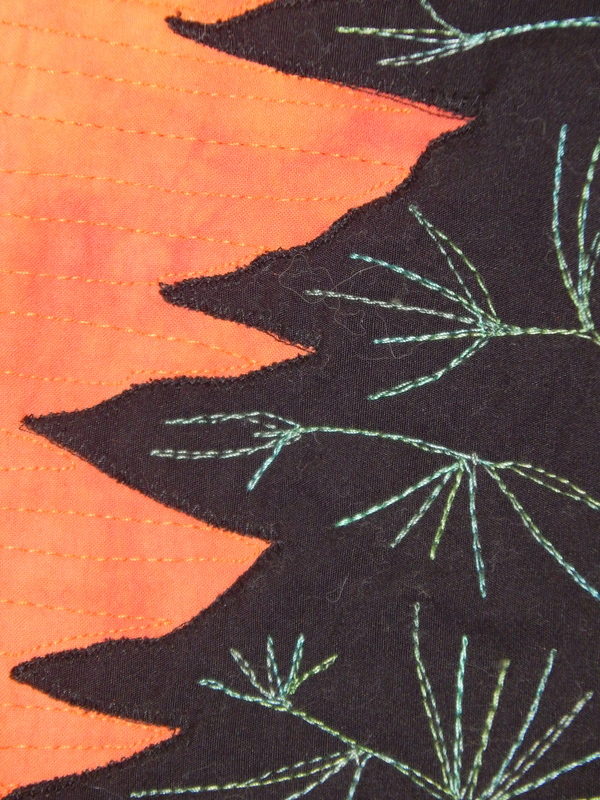 Some I am following the print of the fabric and using that as a guideline for my stitching. Others I just do whatever I want to on top of the print. I think there are about 150 squares on this quilt, and last night I counted 75 of them already stitched. Its really amazing how much you can accomplish by hand when you just keep working at it. Earlier this year I watched a webcast on SAQA by Maria Shell. She was so organized and articulate, with lots of great visuals. I was immediately interested in learning more about her. I found her blog, which is an outstanding blog–well written, and with lots of fun and interesting photographs. She even provided a link to some music that I really enjoyed 🙂 And besides all that, she does absolutely wonderful work! Oh my my my. I showed the fire quilt to MLG (master landscape guy) and that gave him the idea that he could buy a baby quilt for his new grand baby from me. I have lots of unfinished quilt tops, and was pretty sure one or two might work for babies, so I said I’d look around and show him what I had available the following week. I looked in my quilting closet and found a few, and then went out to the storage shed to look through the bins that were out there. 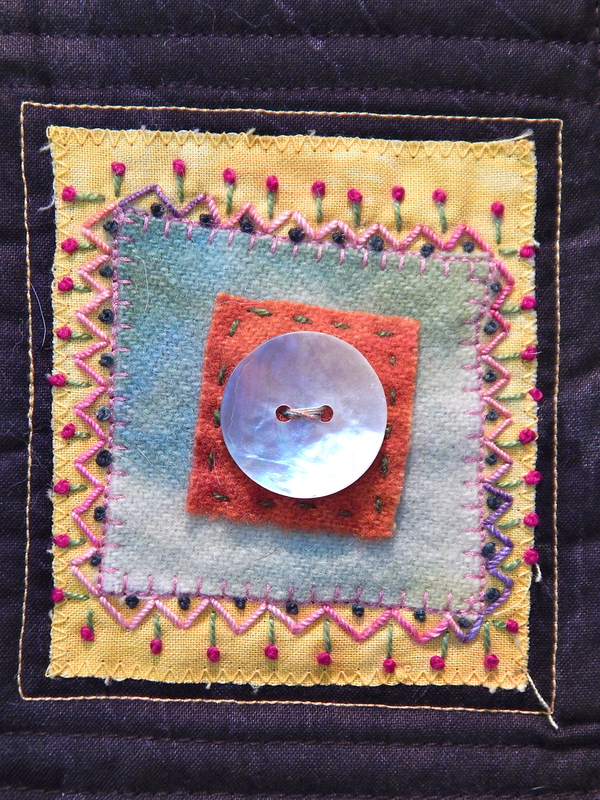 If ever I thought my art quilting had not improved over the years, I found proof in those boxes. 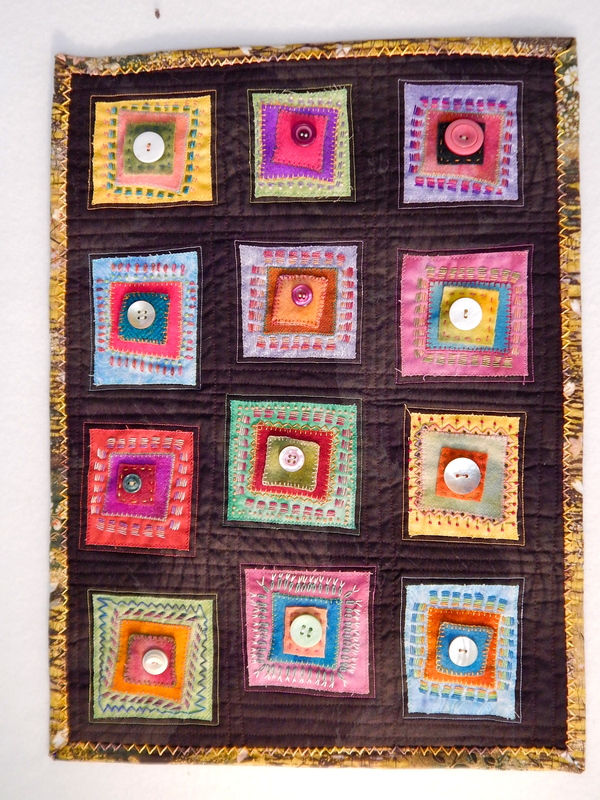 In the “what was I thinking of” category, there were several almost completed “art quilts.” Distressing. Too bad to even share on this blog. But the good news was, it also made me look at all of my many unfinished projects, and I found a fair amount of really nice, traditional type quilt tops. And I found this little piece that was essentially completed. I was enamored of buttons at one point, and had quite a collection. And just playing with colors and wool and thread. Yesterday afternoon I quilted the straight lines on the background, and then decided that I liked the backing fabric for a binding. 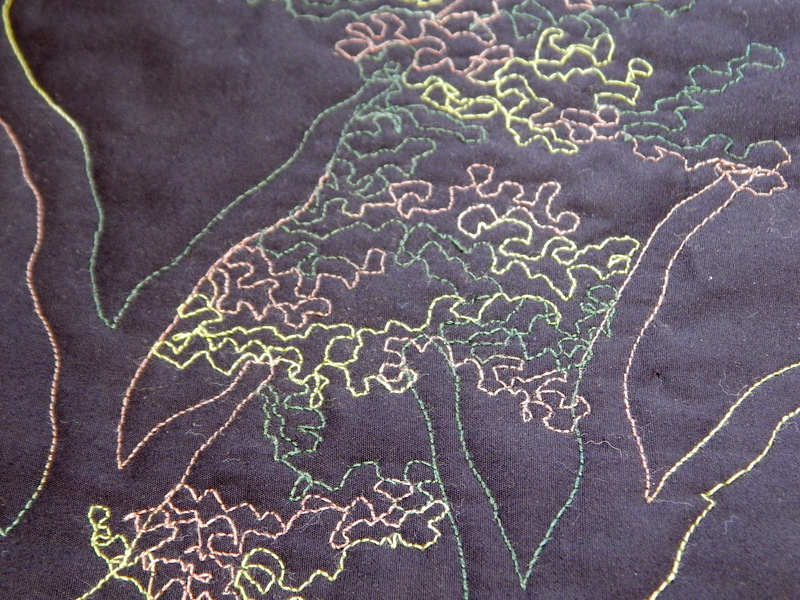 I went to my chair to hand sew the binding on, and there was this hank of perle cotton on the arm of the chair. Hmmm. That would be a fun way to sew the binding down. And ta! da! A little fun piece is finished. You can see I sewed the wool squares on by hand and by machine. 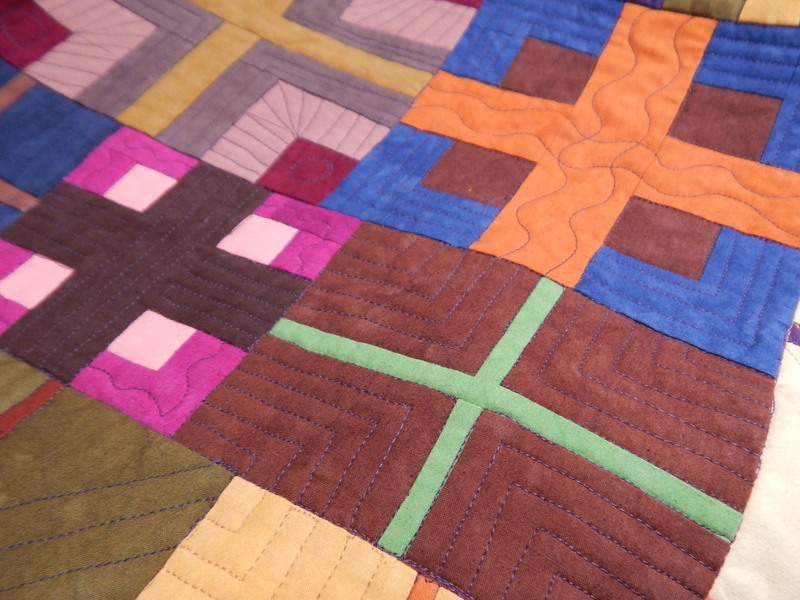 Also, notice how the wool squares are “wonky.” Wool tends to want to stretch out of shape while you’re sewing it. That’s okay with me, but I’m not sure what you would do if you didn’t want that to happen. Maybe use fusible? Anyway, this look has given me a lot of quilting to think about and hopefully work on. Best stop writing and get to work! Our community is still reeling from the aftermaths of the Butte Fire. The final report was just released last night–the fire is 100% contained. The fire started on Wednesday, September 9, and I evacuated the following day. I came home tentatively on Saturday, the 12th, and the following morning, I somewhat reluctantly made my way to church, which was still close enough to the fire that it was smoky in the building. Our church was filled, and several families were there whose houses had burned to the ground! It was such a moving service of worship and sharing. I had an idea for a quilt and drew a little sketch in my journal. And then I sat and stared at the pile of fabrics for a day. I don’t know how to do this. So the next morning, I just took the fabrics and placed them on the design wall in the approximate area I thought each should be. And that’s when I had the beginning of an idea. 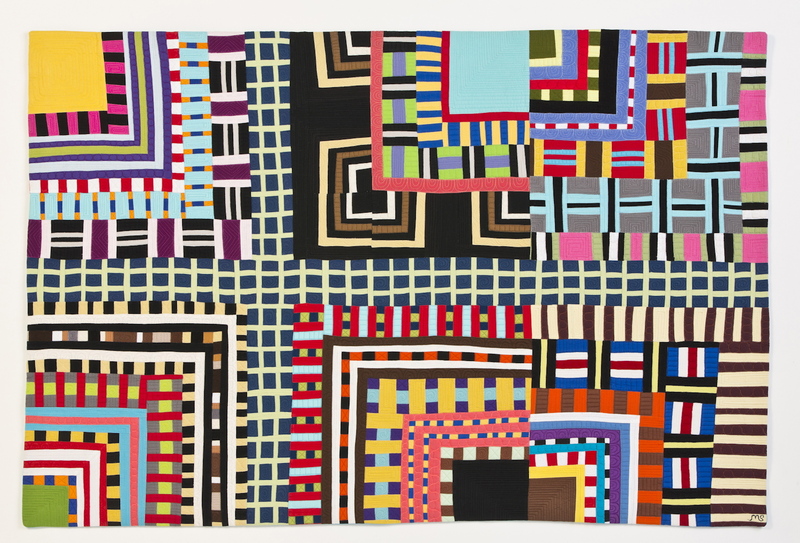 Instead of making it a realistic landscape, I would just make a representational simple patchwork of the colors and fabrics I had chosen. A start! I think it was googling “fire images” that gave me the next idea. 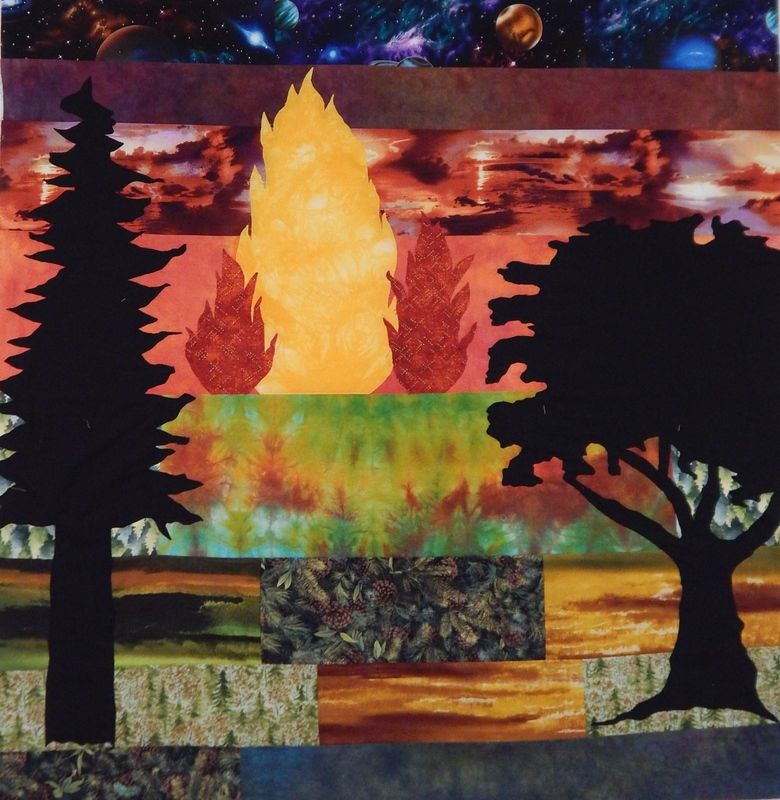 I knew I wanted to include pine and oak trees, but in the fire pictures, many of them were just in outline. That’s what I would do–I would make silhouettes of the trees. Again the thought, I don’t know how to do this. But I googled “oak tree drawing,” and sure enough, there was the inspiration I needed. I was able to draw a rough outline of an oak tree pretty easily. The pine tree was even easier. So there it was. 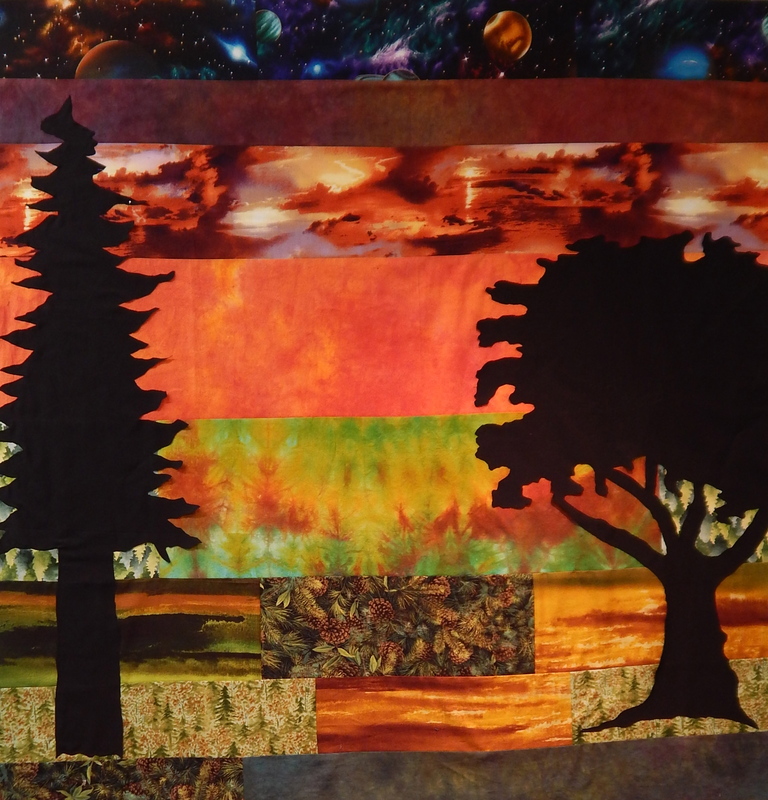 It took a whole day to zig zag the trees in place, because I don’t like using fusible. But, these were huge pieces, and I had the idea to just use little pieces of fusible to make sure they stayed in place. I found my package of Soft Fuse, recommended by Sue Nickels, and it worked fantastic. In fact, I liked it so well, I might use it a little more in the future. I took a picture, and sent it to BF, and that made me think it looked a little empty. 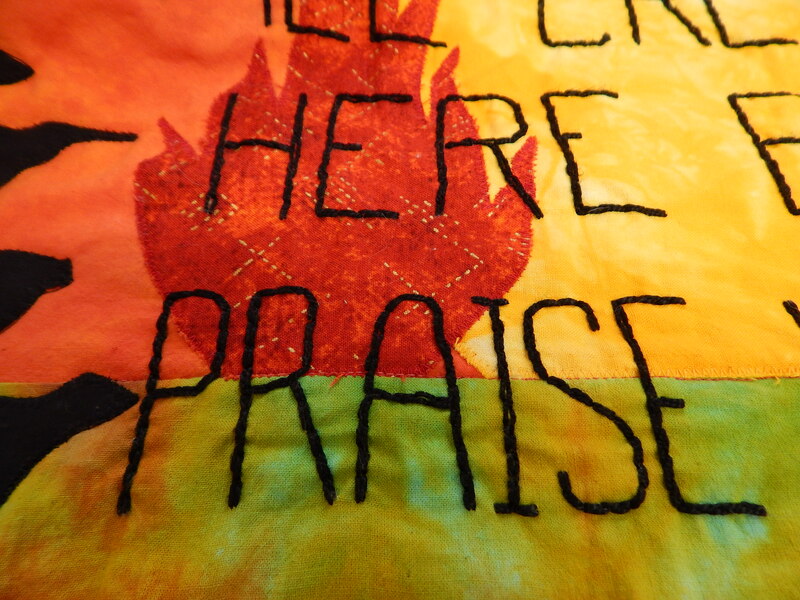 So the next morning, I got out a few more “fire fabrics,” and added some flames. 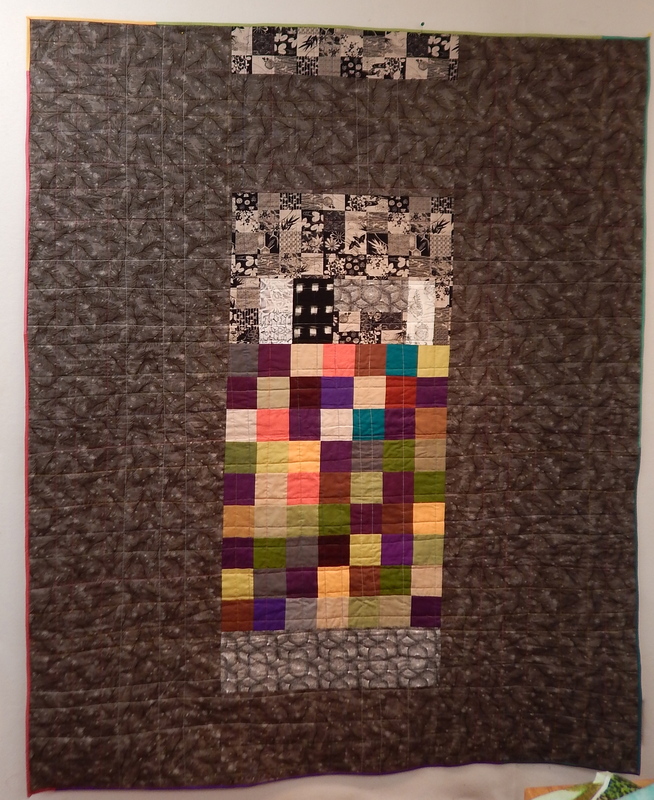 Two days of quilting, and an afternoon of adding a facing, and the quilt is finished. Its always so fun to finish a project and really like what you have done. Its the reward at the end of a long, sometimes boring, sometimes worrisome journey. I’m excited to share it with my church this Sunday. Well, I had ANOTHER little interruption to my normal schedule. I had volunteered to donate a quilt to Noah’s trainer for her organization’s annual fundraiser. She takes in dogs that are essentially hopeless, and turns them into good citizens so that they can be adopted! Anyway, I knew about this way ahead of time, but did I do anything? Noooo…. The event was on Sunday, and Saturday afternoon I was looking for something to donate. I found a top I had actually made into a sandwich, and thought, how fast can I quilt this? It was a challenge! I decided to try my walking foot one more time. I don’t like it very much, but I was hoping it would save me a bit of shoulder hunching so that I would be able to quilt for a longer period of time. 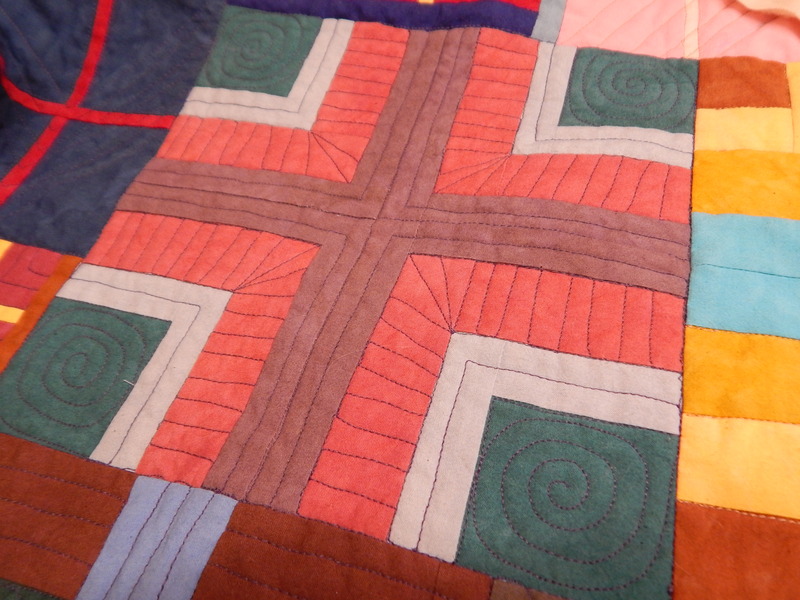 I planned to do straight line quilting, varying the distance from 1 1/2 to 4″ apart. Nothing fancy, but it would make a sturdy quilt. 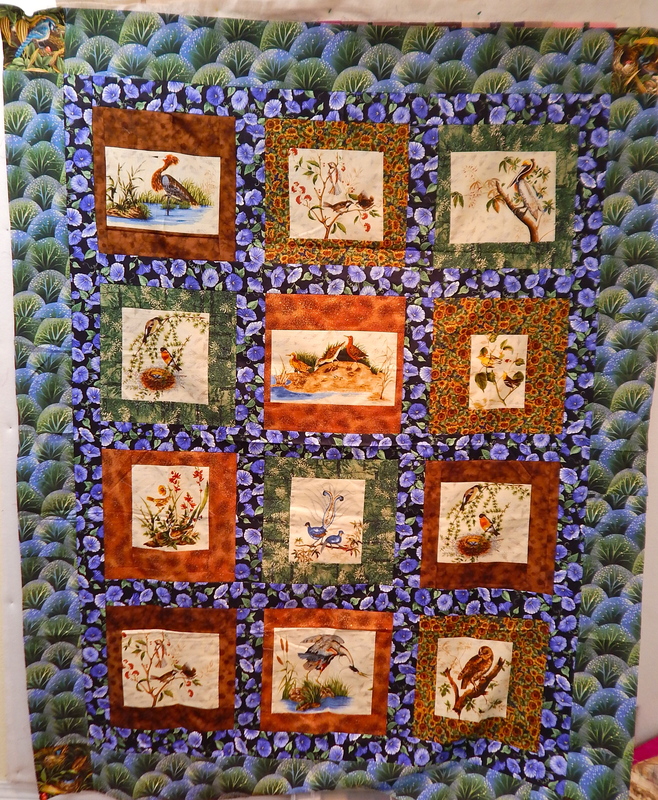 I quilted steadily until about 7pm. Got up the next morning, and quilted the rest of it, and then put the binding on. Threw it in the washer and dryer, and left just in time to get to the event at 3pm! 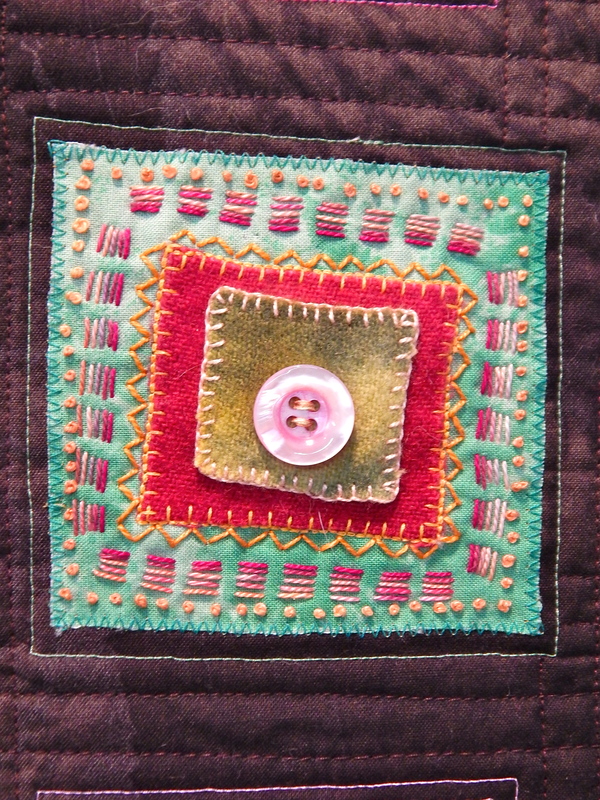 ….only to find that it was cancelled due to the aftermath of the fire… well, at least now I know how fast I can quilt. For the back I used the very last of the leftover squares! 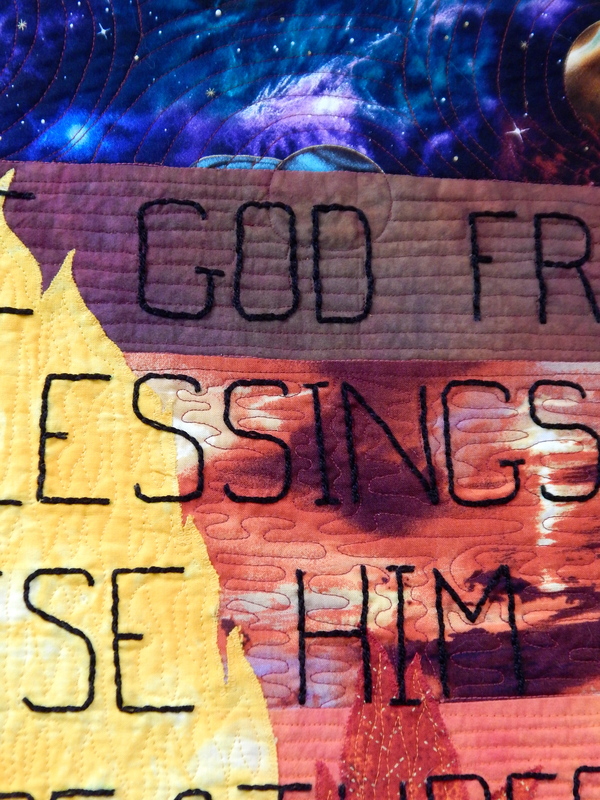 And then it was back to work on my fire inspiration quilt. And there we have an example of some very slow quilting. 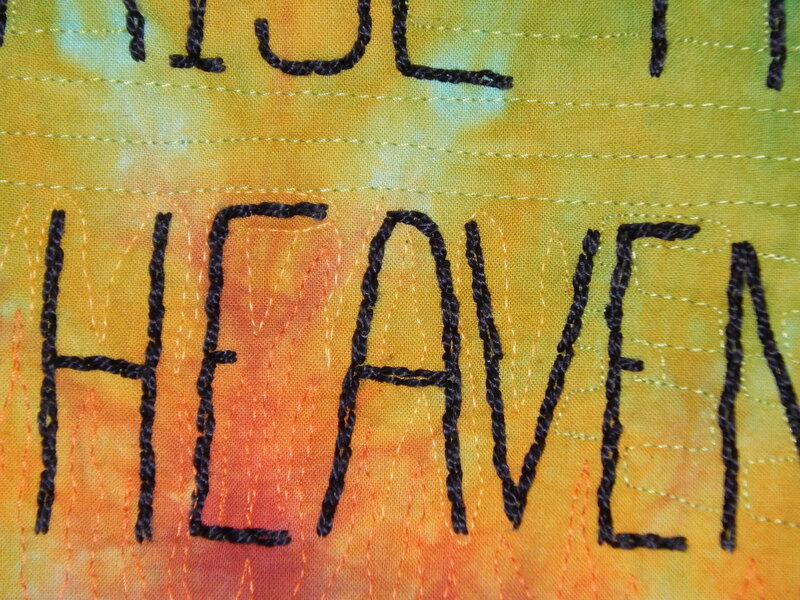 The lettering I chose to be large, and I needed to do a double line of stitching with #5 perle cotton on each letter. I felt like I was moving in slow motion. 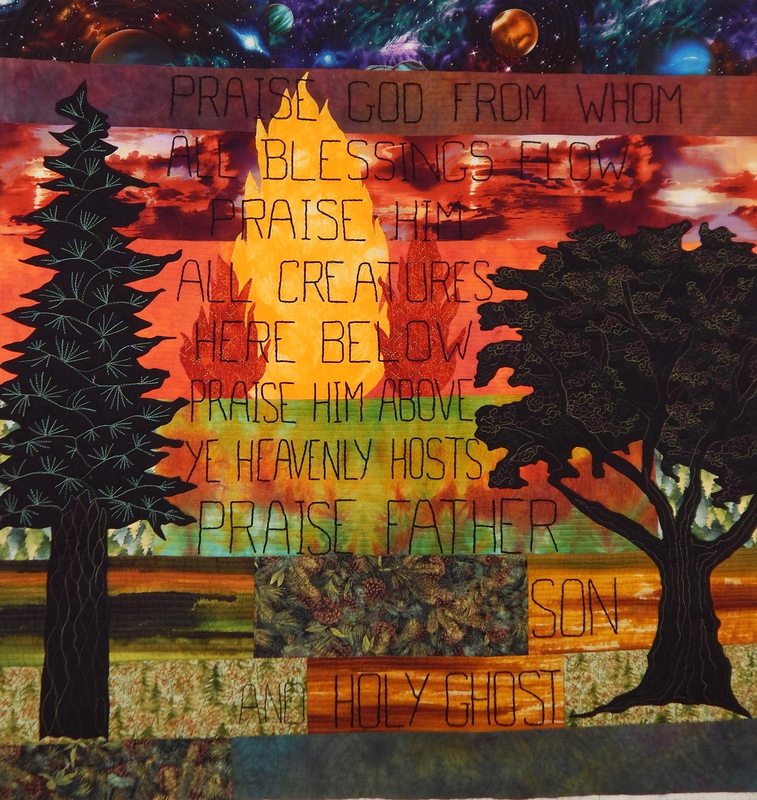 Finally, the day came when the lettering was done, and I could move on to the quilting. That I could do in a day, I was pretty sure. Wrong… to start with, I chose a thread that I really liked, but it was #12 thread. 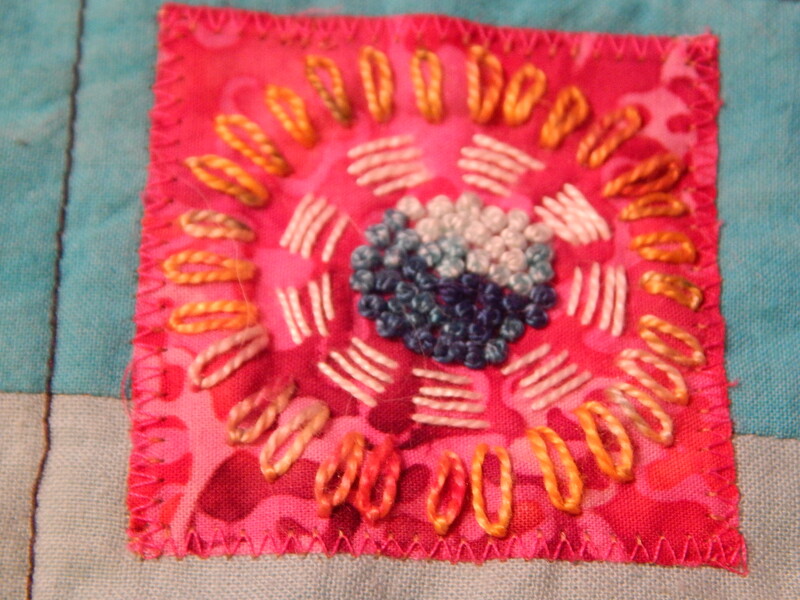 I put a metallic needle on the machine (larger eye for the larger thread,) and started in. You just have to work slow with the large thread. After doing the one tree with this thread, I decided that was enough of that. I chose different threads and went back to work. Ahhh, that was much better. 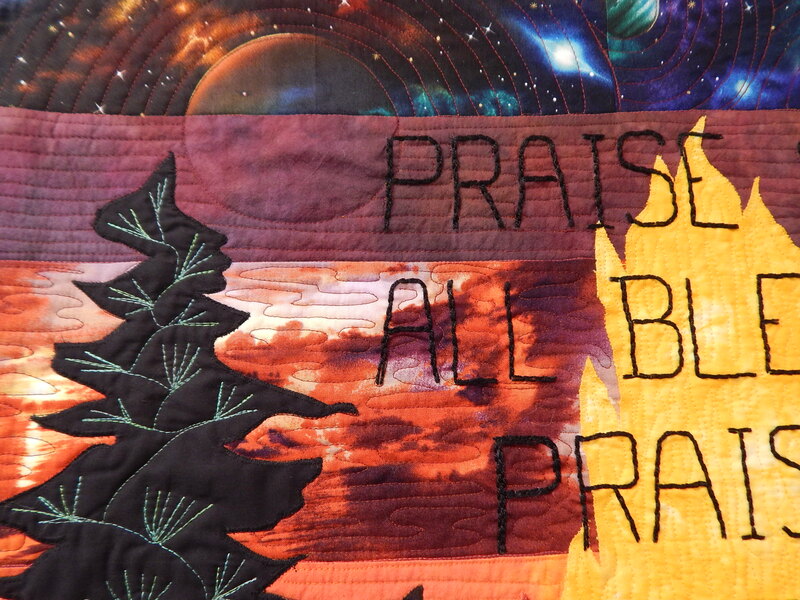 Still, I had to work fairly slowly, as it was fussy quilting, working around the lettering. 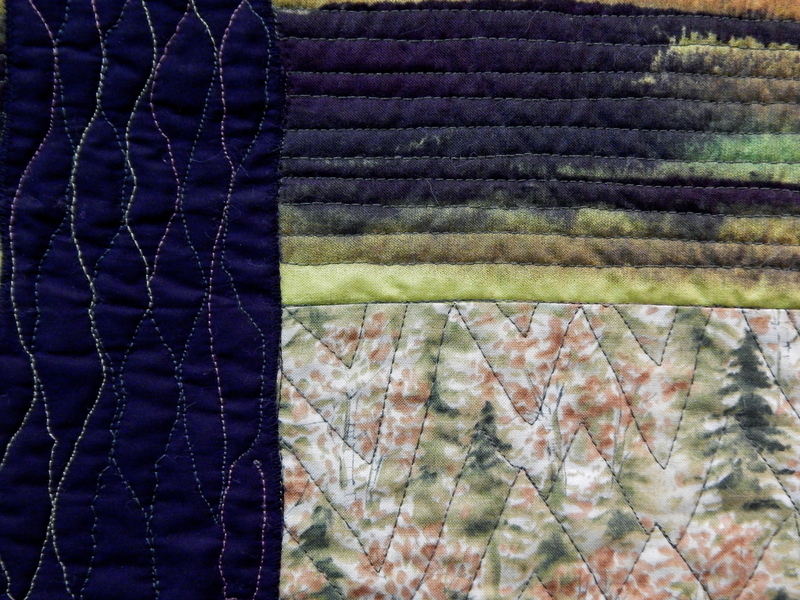 Now, this morning, on my third day of quilting on this quilt, I can see the finish line. Hopefully, I will be able to share the finished quilt with you this weekend!